We have a variety of kennels and can accommodate your dog (or dogs!) to suit size and temperament. Our four kennel blocks have attractive pitched tiled roofs which mean that the kennels are cool in summer and warm in winter. Each kennel has a sleeping area, complete with heat lamp, and an adjoining covered run. During the day dogs have free access to their runs. We also provide individual exercise sessions at least twice a day in one of our specially designed, securely fenced grass paddocks. Exercise sessions are off-lead for the majority of dogs. For those with a poor re-call we attach a light trailing line so that the dog can be safely caught and returned to its kennel after a run. In the morning our guests’ kennels are opened up to allow access into the runs. The staff make a big fuss of all the dogs who like attention and the dogs are checked to make sure everyone is fine and dandy. Kennels are then cleaned of any little overnight accidents, bedding is aired and water bowls are replenished. We then start exercise, after which the dogs have approximately an hour’s rest before their morning meal to minimise the chances of bloat occurring. 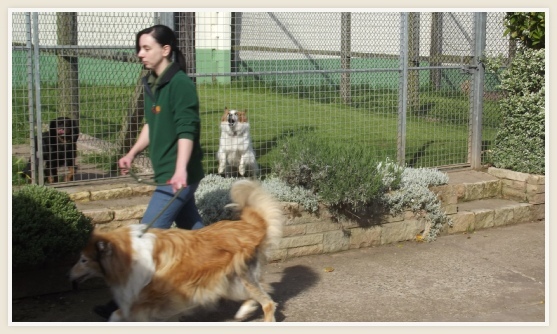 Life in kennels is rarely dull as there are comings and goings and the staff to watch. Dogs are checked again in the late morning and again in the afternoon. There may be another exercise or play period in the middle of the day if the weather is favourable and the staff do not have other urgent duties. following day. There may be more exciting comings and goings, new friends of greet and others to say cheerio to. In the late afternoon, the evening meal is served and cleared, kennels are prepared for the night and everyone settles down to rest, ready for another exciting day tomorrow. We have a dedicated dog kitchen for the preparation of meals from our selection of proprietary dry and tinned foods, including a dry hypo-allergenic one for those sensitive stomachs. You can, however, bring your pet’s own food. If your pet currently enjoys a BARF (bones and raw food) or a Nature diet and you wish to freeze meal sized portions, we will be happy to accommodate this, but please let us know well in advance as freezer space is limited. We aim to give you peace of mind that your dog safe and well cared for while you are away. We only take vaccinated dogs. We do not mix dogs from different owners as it would be impossible to supervise them all the time. This is done for your dog’s safe. All our kennel surfaces, dog beds and bedding can be easily disinfected. It may look rather stark but soft furnishings and carpets cannot be properly cleaned could harbour parasites and diseases that could harm your pet. Your dog will be exercised twice a day in one of our secure paddocks. Grooming sessions can be booked with the SunnyGroom team who can schedule anything from daily brushing to an end of stay bath which will have your pooch smelling clean and fresh for when he goes home.